The first Lutheran service held in Pinconning was February 29, 1884, when Pastor Ferdinand Sievers of St. Paul's Lutheran Church, Frankenlust Township, preached a sermon to a small group of Lutheran Settlers. The first baptismal was also February 29, 1884 when Ida Otthie Dyke, infant daughter of Mr. and Mrs. Adolph Dyke, was baptized by Pastor Sievers. Lutheran settlers present at that first service expressed their desire for regular worship services, and the Pastoral services of the Lutheran Pastors of the Saginaw Valley was requested. Subsequently the Pastors W. Miller, Amelith, and E. L. Arndt, Saginaw, alternately conducted divine worship for the ten Lutheran families. Beginning with the year 1887, the pastors, J. H. Partenfelder of Immanuel Lutheran Church, Bay City, and E. Heinecke of Trinity Lutheran Church, Merritt Township, assumed the pastoral ministration to the parish. The attendance at services increased markedly, so that Pastor Partenfelder reported the existence of a congregation of 40 communicant and 15 voting members for the year 1888. In the fall of 1888 the congregation built the first church on a site one-half mile west of Pinconning and formally dedicated it on July 14, 1889. The same building and premises later served as the Church home of a Greek Orthodox congregation until 1961 when the building was destroyed by fire. After many unsuccessful attempts to call a minister, St. John's Evangelical Lutheran Congregation witnessed the installation of the first resident pastor, the Rev. G. F. Harre, on August 18, 1889. Pastor Harre soon started a parochial school in the home of Mr. O. A. Neumann, and an enrollment of 18 pupils was recorded for 1889. After having served the congregation for 18 months Pastor Harre received and accepted a call to Illinois. During the ensuing vacancy, Rev. J. H. Partenfelder of Bay City and Rev. H. Wente supplied the congregation with spiritual care. In 1890 the legal incorporation of the congregation took place. In August 1893, Candidate E. Partenfelder was ordained and installed as resident pastor at Pinconning. Under his leadership, the Lutheran school was built in 1895. In order to obtain building materials, logs were hauled to a local sawmill by Mr. H. Pieper Sr., H. Samland, Mr. Giese, C. Sibe, Rudolph Neumann Sr., Daniel Dahalke, and W. Pueschel. In 1897, Pastor Partenfelder accepted a call to Trinity Lutheran Congregation in Saginaw. On September 8, 1897, Candidate M. P. Wichmann was installed as pastor of St. John's. He, as his predecessor, not only served in Pinconning, but ministered to fellow Lutherans at West Branch, Rose City and Klacking Township in Ogemaw County. On February 23,1902, Pastor Wichmann accepted a call to Freedom, Minnesota. From April, 1902 until June, 1905, St. John's was served by Pastor F. Rutkowsky, who was called from West Branch, Michigan. The pastor now lived in the village of Pinconning where the congregation had purchased a house and lot in 1902. After June, 1905, Pastor Rutkowsky served Zion Lutheran Church of Beaver Township, Bay County. Pastor H. Schreiner succeeded Pastor Rutkowsky in the fall of 1905. However, due to poor health, Pastor Schreiner accepted a call to Kansas, in May 1906. The Rev. O. N. Frincke of Standish ministered to the congregation for one year until Candidate E. A. Bartusch was installed on August 18, 1907. On February 7, 1909, Pastor Bartusch accepted a call to a sister congregation in Alpena, Michigan. Candidate N. P. Uhlig then assumed the pastoral office at St. John's Church. In May, 1912, after nearly three years of service, Pastor Uhlig accepted a call to Bach, Michigan. Pastor Uhlig passed away in the early 1960s. On June 9, 1912, Pastor W. F. Hagen of West Branch, Michigan was installed. Until 1916, like his predecessors, Pastor Hagen conducted parochial school, in addition to his other duties as pastor. During his pastorate the need for a larger church building was receiving earnest consideration. On May 15, 1921, Pastor Hagen accepted a call to Bach, Michigan. On August 21, 1921, The Rev. H. F. Brietzke became the pastor of St. John's. In 1922, the congregation purchased three lots adjoining the parsonage and built the Fifth Street church. The new church was dedicated on October 22, 1922. The school house was moved to the new church grounds and the old church property, one-half mile west of Pinconning, was sold. In 1924, the congregation again opened the Christian Day School. Pastor Brietzke taught daily until 1930, when due to decreasing enrollment, the school was again discontinued. Pastor Brietzke completed his thirteenth year of service to the parish in November 1934 and then became Pastor of Zion Lutheran Church at Oberlin, Michigan. He retired in Oberlin. For six months, the Rev. R. Bienert of Saginaw served as interim pastor at St. John's. On June 30, 1935, Pastor F. O. Fischer was installed. Under his leadership the Sunday School, the Young People's Society and the Men's Club were begun and have continued to grow. On Sunday, October 23, 1938, St. John's celebrated its 50th Anniversary. The German Service was given by former pastor, Rev. W. F. Hagen of Detroit; while the English Service was given by Rev. H. A. Mayer of Bay City. During Pastor Fischer's tenure, the indebtedness of the Church property was paid off in full in 1941. On June 5, 1960, St. John's honored Pastor Fischer for 25 years of service as its Pastor and for 45 years of ministry in the Lutheran Church-Missouri Synod. At the end of May, 1962, Pastor Fischer retired from active ministry and moved to Westland, Michigan. Rev. Vernon R. Knight was installed on July 15, 1962, coming to Pinconning from Cooperstown, North Dakota. Rev. Knight served as Pastor of St. John's until April, 1969. Rev. James Wilk of Bethlehem, Standish served as St. John's interim pastor until the Rev. William Schultz was installed at St. John's on August 16, 1970. In July, 1972, the community of Pinconning celebrated its 100th Anniversary. As the townsmen got ready for the Historic Event, St. John's formed a committee for the celebration. Along with setting up a Historical Display in the Public School, a German service was held on July 16, 1972. This service was a reminder of how things were done many years ago. During Pastor Schultz's stay at St. John's, plans were made for a new Sunday School Building, which was needed because of increasing enrollment. A building committee was formed with the following members: Reginald Huebner, chairman, Orlo Boetefuer, Don Hartwick, Sr., William Jonas, Julius Rabe, William Rosenbrock and Billie Weber. Plans were made, adopted by the Church Council and approved by the voting members of the congregation. After 75 years of service to the Lord, the old Sunday School Building was razed to make way for the new structure. Shortly thereafter the Ground Breaking Service was held and construction began. On Sunday June 3, 1973, St. John's dedicated to the Lord this new building designed by Douglas C. Morris of Bay City and built by Freidinger Builders of Bay City. Rev. Schultz served St. John's until July 20, 1975. The Rev. Richard W. Collin was installed at St. John's on January 4, 1976. The inspiring sermon was given by Dr. Richard Schlecht, President of the Michigan District of the Lutheran Church - Missouri Synod. Pastor Collin ministered to the growing congregation at St. John's from January 1976 until November 1979. During his stay, the parsonage was sold and removed from the Church grounds and the need for a larger worship facility became apparent. Therefore, in 1977 a Building and Planning Committee was formed, consisting of Mike Brooks, Bill Jonas, Ed Pross, George Gobrogge, Bob Kocisky, George Rabe, Marvin Hasso, Dan Miles, Bill Rosenbrock and Ron Gage. In May, 1978, the congregation voted to purchase 13 acres of land on Pinconning Road, near the location of the original church. 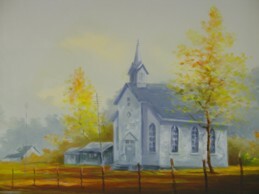 In 1979, a committee, known as the Program of Progress, was formed with the goal of paying off the School House mortgage, funding the new church property and working toward the building of a new church. Members of this committee were Ron Gage, Chairman, Esther Gobrogge, Clarence Neinas, Orlo Boetefuer, Irene LaPan, Marvin Hasso, George Rabe, George Gobrogge and Alvin Neumann. On January 27, 1980, the Church held a service to celebrate the first goal of the Program of Progress - the burning of the School House Mortgage. Guest Speaker was Rev. Frederick Reimann. In May, 1980, the new property was paid off and St. John's was ready for the third phase of the Program of Progress. In June, 1980, the Rev. 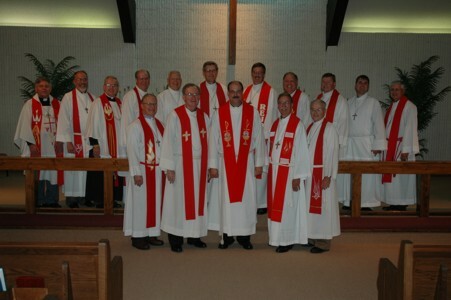 Mark Pflug was installed as Pastor of St. John's. The sermon was given by the new Pastor's father, Rev. Edgar Pflug. The Liturgist and Installer was the Rev. John Wm. Rauh, Bay Circuit Counselor, and Pastor of Zion Lutheran Church, Bay City. Pastor Pflug worked very closely with the members of the congregation towards the building of a new Church. A Building Committee was formed and members were: George Gobrogge, Chairman, George Rabe, Bill Jonas, Marvin Hasso, Dan Miles, Ed Pross, Mike Brooks and Bob Kocisky. 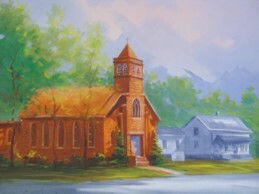 With both the approval of the Voters Assembly and a loan from the Church Extension Fund, plans were made to build a new church. The new church was designed to give St. John's a better facility to serve both its growing membership and to minister to the Pinconning Area. This building had a seating capacity of 300 people, a choir area for 24 members, a Narthex with seating for 60, giving total seating available for 384 people. The church complex also had a larger Sunday School area, a library, parking lot, kitchen facilities and a Fellowship area. Guy R. Wegener was hired as the Architect and in October, 1981, the Voters Assembly accepted the low bid for construction of the new church. On November 22, 1981 a special Ground Breaking service was held and construction of the new church was begun in November, 1981. 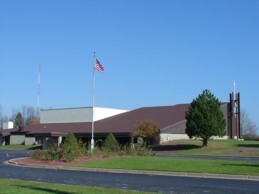 The cost of the new facility was approximately $500,000.00. The bulk of the construction work was done by Wm. Bronner and Sons of Frankenmuth. In December, 1981, the cornerstone of the church building in Pinconning, which had been placed in May, 1922, was removed. Found inside the cornerstone were copies of the TOLEDO EXPRESS printed in German, THE BAY CITY TIMES TRIBUNE, a German Bible, the Lutheran Witness and the program for the dedication. In February, 1982, a committee was formed to compile the memorabilia to be placed in the new cornerstone. This committee consisted of Esther Gobrogge, Don Michalski and Bill Stinson. The new cornerstone was donated by Francis Lee, of Pinconning and is inscribed, "TO GOD BE THE GLORY". Dedication of the new cornerstone was held June 20, 1982. Under the leadership of Pastor Pflug, a men's fellowship group was initiated with a Men's Retreat in January, 1982. At one time, the Men's Club was the most active in the church. Another agency of the church is the Sunday School organized in 1935, by Pastor Fischer, St. John's Sunday School had an enrollment of approximately 28 children and four teachers. Five years later, in 1940, the enrollment totaled 38, with four teachers. By 1950, the enrollment reached 64, and there were now six on the teaching staff. By 1963, the Sunday School enrollment was 122 with a staff of 12 teachers and 2 substitutes. In June, 1963 a Nursery Class was organized for children 3 years of age. In January 1963, a Sunday School Superintendent was selected and the Sunday School teachers elected a staff of officers. In the early 1980's, the enrollment was 120 with a staff of 15 teachers and 8 substitutes and helpers. There was a Board of Education consisting of 6 members, a Sunday School Superintendent, an Assistant Superintendent and a Secretary/Treasurer. The Ladies Guild began as the Ladies' Aid on February 20, 1910 with 28 members during the Pastorate of Rev. N. P. Uhlig. Its purpose was to foster Christian fellowship and to beautify the church. Mrs. Fred Fischer introduced the Ladies Aid to the work and program of the International Lutheran Women's Missionary League which is now incorporated into the work of the Ladies Guild. Many projects of education, social help, and missionary support have been added to the original purpose of the Guild as an ‘aid’ to St. John's. The Annual Sauerkraut and Sausage dinner has become a community event with the Guild giving sponsorship to an activity that requires a lot of work and provides some good fellowship for hundreds of congregation members each year. In the 1980's projects within the church include the furnishing of the new kitchen, the crafting of "Chrismons" for the Christmas Tree in the new church, and quilting and creating for the Annual bazaar together with fellowship and Bible Study. The Youth first joined in an organization for fellowship and service during the ministry of the Rev. Frederick O. Fischer. For many years as a member society of the International Walther League the youth enjoyed good times together and served their Lord and church in many ways including the support of the Wheatridge Sanatarium for Tuberculosis. During the 1980's, the Youth have affiliated with Lutheran Youth Fellowship and have worked in Evangelism, in leading special worship, and in preparing the ball field at the new church as well as growing in Bible Study and enjoying outings just for fun. A three-year Pastoral Vacancy was filled by two seperate Intentional Interim Pastors. Rev. Eric Lambart served St. John's for six months until the Lord suddenly called him home. Rev. David Hakes then ministered to the needs of the congregation for a period of over two years. On September 11, 2005 Rev. David A. Jung from Dearborn, Michigan was installed as pastor of St. John’s. The Rev. Dr. C. William Hoseman, president of the Michigan District-Missouri Synod was the preacher and installer. Rev. William Alwardt, the Bay Circuit Counselor, served as liturgist.